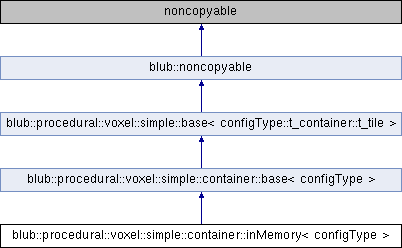 The inMemory class stores all voxels in instances of tile::container and safes them in a very fast in-memory-container. Accessing a voxel-container costs O(1). The class does not save tiles that are full (container-tile returns true for isEmpty() ) or that are empty (container-tile returns true for isFull() ). Instead the class saves the state empty/full. Tiles that are full or empty dont produce a surface. worker May gets called by several threads. setTileBounds sets the size for the map. Call for optimization, if you know the tile-dimensions before editing. Reimplemented in blub::procedural::voxel::simple::container::database< voxelType >.